Now that we’re through the holiest of holy days in Christendom, I thought we’d turn our attention to some things that may have escaped your biblical training in Sunday School. If you didn’t have the joys and wonder of a Sunday School education, consider this a non-orthodox approach rectifying this oversight. There’s so much that’s tucked in-between the familiar stories that have little gems just waiting for us to discover! Are you familiar with the story of the woman who drove a tent stake through a retreating captain’s head? I didn’t think so. It’s found in the very popular (not!) book of Judges in the Old Testament. Believe it or not, there are a few modern lessons in this ancient story. Usually Deborah, the only woman judge in ancient Israel, gets all the glory, but Jael is really the heroine. Our story starts out with the ominous: The Israelites again did what was evil in the sight of the Lord. Already we know the situation isn’t good for the Israelites. They were often in the habit of doing what was evil in the sight of the Lord and it usually resulted in the Israelites being handed over to whomever was trying to occupy their land. The stories of the Old Testament are told in a very cause-and-effect manner to illustrate a point. In this case, the Israelites were doing evil and so God sold them into the hand of King Jabin of Canaan. Basically, they strayed from their faith and practices of their faith community and, as a result, were an easy target for the king representing a rival nation. What really interests me about this is that the strength of the Israelites, individually and as a community, lies in their cohesion with God and one another. When they were following God and united as a community worshiping God, they had an identity and strength that set them apart from the other nations. Their sense of mission and purpose as a people was clear. It was intimidating to outsiders, and the unifying factor, set them apart. It was like they had a code that guided them in how relate to God and others. It provided a framework for their lives and it served them well. When they discarded that framework or lost sight of their beliefs, they found themselves in a heap of trouble. What do they Israelites do when they find themselves oppressed and at the mercy of nine hundred chariots of iron, or on the receiving end of the latest military technology? They cry out to God for help! They recognize that their own efforts aren’t effective, so maybe it’s time to start bargaining with God … again. As many of us know, that may provide temporary relief, thinking God is so glad to hear from us, God will wave the magic God-wand and solve this dilemma for us. Of course, we know it doesn’t really work that way. God is always there for us. It’s usually us that move away from God. The real difference comes in being able to draw upon strength for all situations … good and bad … cultivated over time by developing a relationship with God through prayer, reflection, study, and talking with others. When we invest in developing our faith and character, it will be there to serve us in difficult and trying times, as will the people who are in our Amen corners. Hazor was a strategic city along the most important trade route of ancient times. The tyrant King Jabin commanded this city and the important trade route. In fact, this area was often the scene of important battles in ancient times, not too unlike other areas that hold important and strategic interests for modern nations. Through the brilliant help of Sisera, Jabin exercised military control over several major tribes in that area. The military position of the Israelites was appalling. They were no contest for the superiorly armed, manned, and positioned Sisera. The Israelites turned to Deborah for answers to their dire predicament. They must have been separate because they turned to a woman! I prefer to think that they recognized in Deborah qualities they did not recognize in anyone else, and thus sought out her leadership. Whatever the situation, women were treated better in Israel than other ancient nations, but it was still a far cry from equal opportunity status! She calls upon her faithful, experienced general, Barak. She’s been thinking about this because she lays out a strategic offensive. Of course, the experienced general thinks she’s completely uninformed because he knows of the military advantage Sisera. Sisera is unwilling to go on this suicide mission alone, and requests or demands(?) her presence with him. Oh, and he did summon ten thousand to join them. And that was about all they had; ten thousand men with maybe a few weapons against a well-trained, well-armed massive army. The one advantage that Barak had was his strategic location (the top of the hill) from which to launch his attack. Needless to say, the Israelites wiped out everyone. Everyone, that is, except Sisera who fled on foot. Not even a lone chariot to carry him away. He knew that Heber the Kenite and his clan were allies with King Jabin, so he ran there for refuge. Jael, Heber’s wife saw Sisera coming, alone, and went out to meet him. Who knows what was going through Jael’s mind?!? Maybe she felt it was safer for her since he was alone. Because he was alone, maybe she surmised that things had gone terribly wrong for him and he was looking for a place to hide. He may have been an ally of her husband’s, but she herself was an Israelite, and he was a threat to her real people. Who knows what she was thinking when she invited him into the safety of her tent. Whatever it was, she extended hospitality as was expected among nomadic people. She feed him and gave him a comfortable place to rest. For a captain to flee from a battle was embarrassing. For him to be killed while fleeing was humiliating. But to be killed by a woman was the most disgraceful thing of all. Deborah’s prophecy to Barak, that the glory of victory would go to a woman, was fulfilled. Jael had no way of knowing Sisera would show up at her tent door or his purpose. She made a judgment call to do, what she considered to be, the right thing. As a result she is remembered in the stories that were originally passed down orally from generation to generation, before being recorded in the book of Judges. Her actions fulfilled a greater purpose for the people of Israel, all while remaining true to who she was, where she was. We never hear anything else about her. Your mission, should you choose to accept it, is to ponder your own mission and purpose. Who knows what we’ll uncover next time in Things You Don’t Learn in Sunday School. 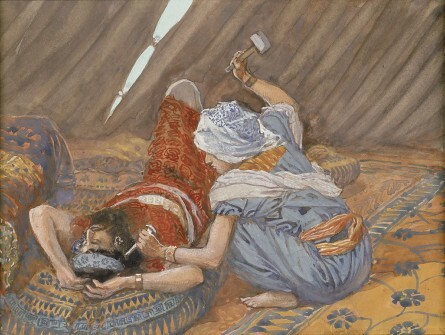 Photo credit: “Jael Smote Sisera, and Slew Him,” by James Tissot in the collection of the Jewish Museum, New York.